Well, this happened. My mum went into a spin last night when she first heard about it. Initially I thought she was being a bit unreasonable. But having read about it this morning, I can confidently say that the Coalition's new policy is nonsensical and xenophobic. Here's what's happening: Julia Gillard last year announced the Houston Review, in classic get-the-military-involved-in-refugee-policy style. The end result of that review was that there should be a "no advantage" policy, under which coming to Australia would not get you settled any more quickly than waiting in a UNHCR camp. So there are quite a lot of people in Australia who basically aren't getting their claims processed, in order that they don't get any advantage. These people arrived over the last year, before Rudd's policy switch. They are now here. 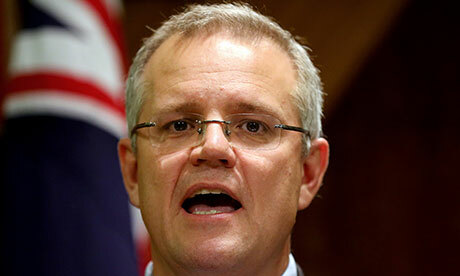 Scott Morrison and Tony Abbott are now saying that they will never get permanently settled in the country. The thing that makes refugee policy difficult is this: it's horrible to treat asylum seekers badly when they arrive in Australia by boat. But treating them well makes the trip more appealing and so encourages more refugees to undertake it, which is bad because - at least in the brazen politics of crocodile tears we're currently engaged in - the journey is dangerous and they'll be risking their lives. So treating asylum seekers badly is, at least possibly and partially, justifiable because it helps save the lives of many more. The premise of all this is that asylum seekers who are deciding whether to take the trip will be treated the same way as those who have already arrived. That might be fair for the most part, but the people Scott Morrison is talking about arrived under a regime which has been explicitly dismantled and rejected by both parties. What happens to these people simply has no bearing on the incentives for future refugees. Treating them badly doesn't discourage new arrivals. It is just treating them badly. And boy is it treating them badly! Abolishing the right to appeal a decision against you is a straightforward contradiction of basic tenets of justice. (It's also, as a law professor patiently explained on the ABC this morning, not actually legally possible; most likely, dismantling the current appeals system will just mean those appeals go through federal court.) It's far from clear what this measure would do under any circumstances: the group of refugees who think that their claim will be rejected at the first pass but then granted on appeal and decide travelling to Australia is worth it on that basis is presumably quite small. But under the current circumstances it's just pointless and unjust. The other thing is Temporary Protection Visas. These grant a refugee permission to live in the country, but only until the government decides they can safely return home. A refugee on a TPV cannot bring their family to Australia, nor can they return to Australia if they leave, no matter how briefly. In some cases they have less right to work or access welfare. So a TPV leaves a person in brutal limbo, with no capacity to see their family and - lacking any idea about how long their protection will last - a cloud hanging over any attempt to establish a proper life. It does this not to people who have been found not to be refugees, or to people who are having their claims processed, but to people who have already been found to be genuinely in need of asylum. And in the latest iteration, it does all that for no deterrent value whatsoever. Well, maybe it's not about deterrence. Scott Morrison, in fact, says as much - he's worried that all the "focus on stopping the boats" (wonder where that came from, Scott!) "sort of passes over what's almost a bigger task, which is the legacy caseload of tens of thousands of people in the system." Of course, abolishing the right to appeal in order to clear judicial backlog is straightforwardly, almost laughably unjust. And TPVs - which change how refugees are treated after their claims are processed - don't change how long that processing takes at all. But it was a nice try. "This is our country and we determine who comes here," he said. "That was the position under the last Coalition government, and that will be the position under any future Coalition government."